InsideFont is an application which provides a peek behind the scenes of font files to anyone interested. The application presents and illustrates the relationships and structures inside of font files, how encoding works and how glyphs (characters) are built up in detail. The application InsideFont is available for Windows and Mac. As InsideFont uses web technologies (SVG) for displaying the numerous graphical information, it's recommended to have a modern web browser installed. Addtionally lots of wrapper formats are recognized e.g. Mac Resourc ‘sfnt’ files. The ADi-FontEngine is able to analyze large bunches of font files and store relevant information in an internal database. This creates the so-called font cache which allows fast access to required information of any font file without dependency to the system. 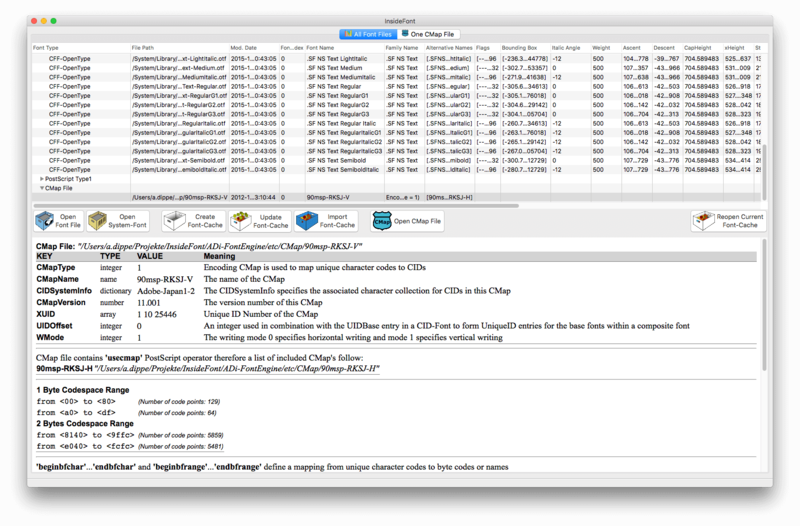 The font analysis makes use of all skills of modern CPUs by using multithreading to analyze multiple font files at the same time. The reading of an already existing font cache is extremely fast so InsideFont can show all fonts without delay after a restart. 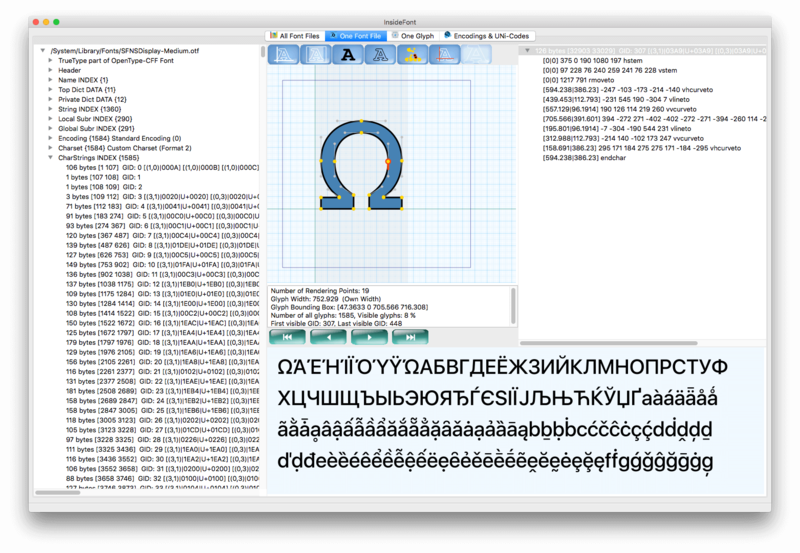 Starting with version 1.1.007, InsideFont can open and view individual font files as well as fonts registered in the operating system. This is possible via the program Menu “File” - “Open Font File” (or F3) and “Open System Font” (or F4) or via the buttons in the middle of the program. As mentioned earlier, the font cache is a central object of the ADi-FontEngine, so InsideFont uses it as well. To create a font cache see the program menu “File” - “Create Font-Cache” (or F5) or use the button (see picture on the left). Create the font cache by clicking the “Create Font-Cache” button (or F5) and then selecting a folder containing font files. On the first try, the system font folder is displayed here. After all files have been scanned and the list has been updated in the program, all fonts have already been identified and the font cache has been created. The next time the program is started, the font cache is opened immediately. The button “Reopen Current Font-Cache” (or F11) goes back to the beginning and reads in the font cache again. The button “Update Font-Cache” (or F6) allows you to select another font folder, scan it and save it in the font cache. The “Import Font-Cache” (or F7) button imports an external font cache and adds its contents to the existing one. Select a font in the list to preview the font. In the program menu “Pangram Select” the preview of the Pangram's can be made more selective. Use the tabs to get a deeper look at the font. 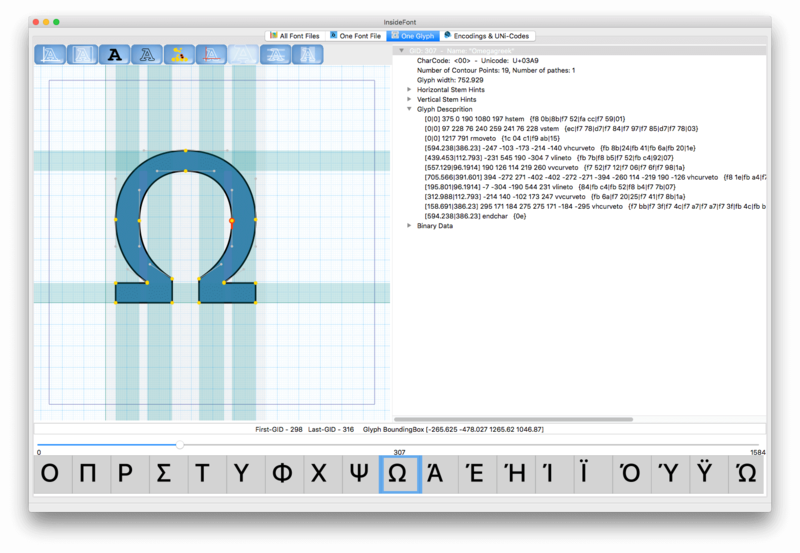 In the lower area a glyph preview is displayed for a selected font. The displayed texts are called “Pangrams”. Via the menu “Pangram Select” one can select the desired language. (Further information about pangrams). This is a detail view for a selected font. The view differs in dependency of the font type. There are 3 main font types PostScript Type 1, TrueType and CFF. It might be difficult to understand the relationships here without knowledge about the structure of the previously mentioned font types. Here are some links which might help. There are mainly three different formatgs to encode outline fonts with, TrueType (OpenType too), CFF (Compact Font Format) and PostScript Type1. The differences are not limited to the inner structure of the font files but even affects the definition of glyphs, i.e. how the vector graphics of glyphs are cretaed. PDF relevant tables are ‘cmap’, ‘glyf’, ‘head’, ‘hhea’, ‘hmtx’, ‘loca’, ‘maxp’, ‘CFF’, ‘cvt’, ‘fpgm’ and ‘prep’. All encoding information can be found in the ‘cmap’ table. Glyph descriptions are defined in the ‘glyf’ table. If there is a ‘CFF’ table in the font it's propably an OpenType font using CFF outline data to describe its glyphs. Additionally there are TrueType Collections, containers which contain more than one TrueTyp font. The individual fonts are built up like TrueType fonts. InsideFont also analyzes all TrueType-Instructions in the tables ‘fpgm’ and ‘prep’ for syntactically correctness. Occuring errors are displayed. The setup is defined by many structures, those are much extensive, confusing and often interdependent. Mainly exists as OpenType font files only. In PDF files the OpenType shell can be omitted. Thus CFF fonts can be embedded as native format. The encoding is defined in the “Encoding” and/or “Charset” array and the glyph descriptions in the “CharStrings” Dictionary. CFF fonts are a compact form of PostScript Type1 fonts. I have to say that I really like the structure of those fonts. As CFF fonts does not have structures with fix byte length' like TrueType fonts, a parser/interpreter is required to be developed to read and interpret the font sequentially. Encoding is here realized either via glyph names or as an CID font with help of CMap files. This are PostScript files defining one or more font resources. In principle everything defined in PostScript standard is allowed. In practice only 65% of the PostScript operators are required, one only needs to know which are. The encoding is defined in the “Encoding” array and glyph descriptions in the “CharStrings” dictionary. Thus for those fonts an entire PostScript parser/interpreter is required which development is a difficult challenge itself. 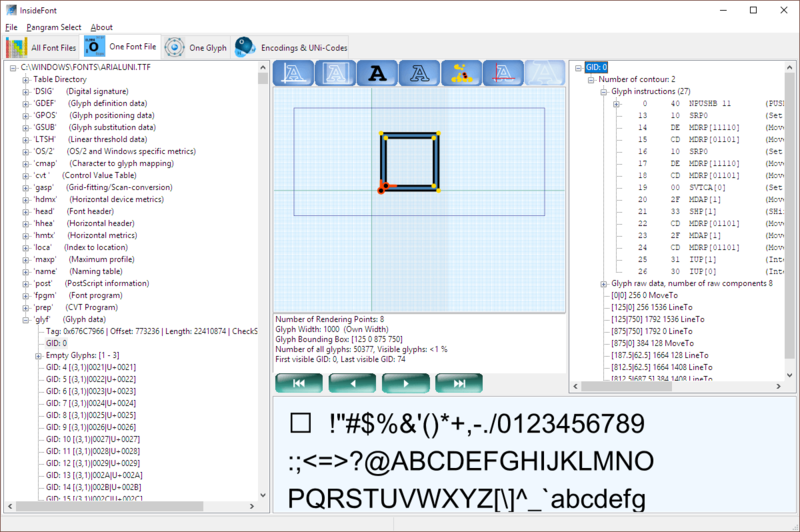 Glyphs of the selected font can be analyzed individually. The display also includes the dots of single contures, stem hints and binary data. The glyphs (characters) are the stars here. In the left area of the window the selected glyph is displayed. This view can be made more selective via the buttons (see picture above). General information, like encoding, glyph name, etc. are displayed in the tree control on the right side. Followed by a detailed list of glyph character commands and conture dots. The listing strongly depends on the font type. The binary data forms the closure for TrueType and CFF fonts, these are the raw data. InsideFont also analyzes all TrueType instructions in the glyphs for syntactically correctness. Occuring errors are displayed. In PostScript Type1 fonts may be native PostScript code is displayed when there is a link to a “OtherSubrs”. A single glyph is displayed in the lower area. Here the slider control should be used to navigate faster through the existing glyphs as there are fonts with thousands of glyphs. * Hinting information are available for CFF and PostScript Type fonts only. This is because of they are directly defined in the glyph description. It are hints for a rasterizer to better adjust dominant vertical and horizontal bars in glyphs to the output raster. In this tab all information for the identification of glyphs is presenetd. This is widely known as encoding. Unicodes are the identifiers (ID) of glyphs because the question in a computer surely is: What kinda character is this at all in this font? Unicodes are defined in an internantional standard (ISO 10646). A Unicode is a number assigned to a character as ID. This assignment is done by the ISO (International Standardization Organisation) (The History of Unicodes). The unicodes are devided in ranges depending on their language and writing system. For example there are ranges for “Basic Latin”, “Mathematical Operators” or “Greek and Coptic”. In this tab the unicodes found for the selected font are presented. There is a graphical overview about the so-called BMP (Basic Multilingual Plane) in the upper left. These are the unicodes from U+0000 up to U+FFFF. The ranges inside of this overview can be clicked to get the corresponding glyphs displayed on the right side. The glyphs of the selected unicode range are displayed on the right side. While hovering a glyph with the cursor its glyph id and its unicode are displayed. 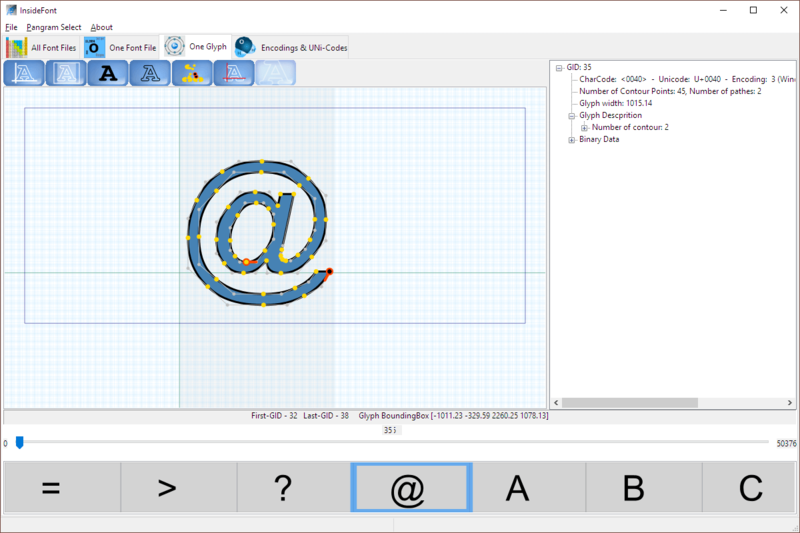 On click the glyph becomes the first glyph in view. There is a tree control in the lower left which also displays the unicode ranges and their corresponding glyph indices in TrueType and CFF fonts. In PostScript Type1 fonts the glyph name is displayed instead of a glyph index. Is a single unicoded selected it becomes displayed as the first glyph in the right view. There is a link “Show Summary Text” in “About” menu. If it get activated a text control is displayed below which contains the unicode information in a copyable form. The link has a similar effect on the first tab “All Font Files”. 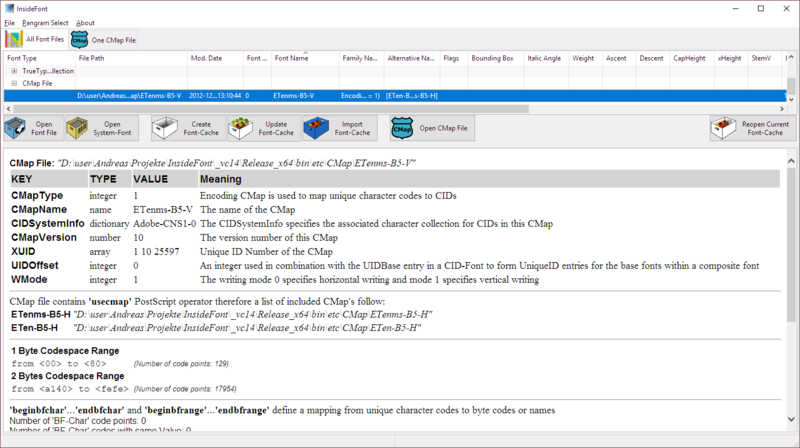 For the very first time, InsideFont version 1.1.007 provides the posibility to view and analyze information from CMap files, used in PDF environment to define translation tables for character codes to glyphs. Syntactically issues as well as conformity issues are found and displayed in correspondig colors. The CMap format origins from Adobe and is used there for encoding purposes in PDF environment. These are e.g. translation tables for character codes to CIDs or character codes to unicode for example. Every time you install the Acrobat Reader, CMap files are installed as well. Internally CMap files are programmed in PostScript code. Because they can contain lots of confusing information InsideFont got the possibility to analyze them. InsideFont also delivers CMap files. Such encoding files are located in the directories etc\Encoding and etc\CMap. The “Open CMap File” button (or F9) opens a CMap file and presents selected data. If one selects an opened CMap file in the list a special tab “One CMap File” is created. It's worth a look on this tab to get a more detailed view. Here all code points are displayed in a table. Because of the mass of information a resorting of the table may help for a better overview. CMap files are required for mapping or translation tables to assign a specific value to a byte code of variable length. 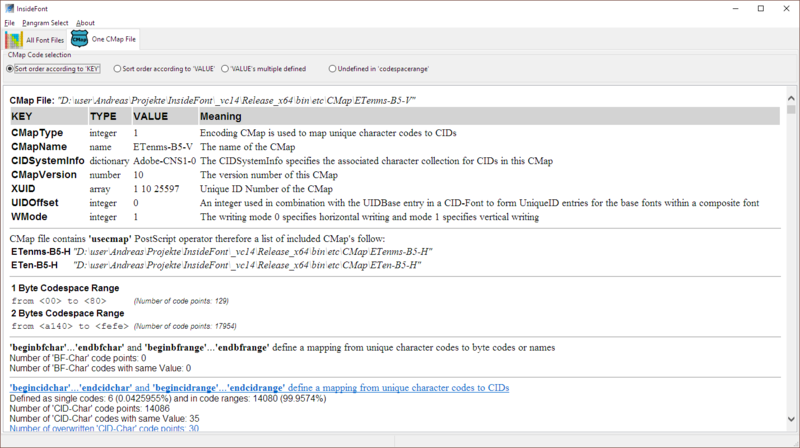 In PDF, mappings of character codes to CIDs and to unicodes are required. To limit the amount of possible character codes it's required to setup valid ranges. This is defined by code space ranges. 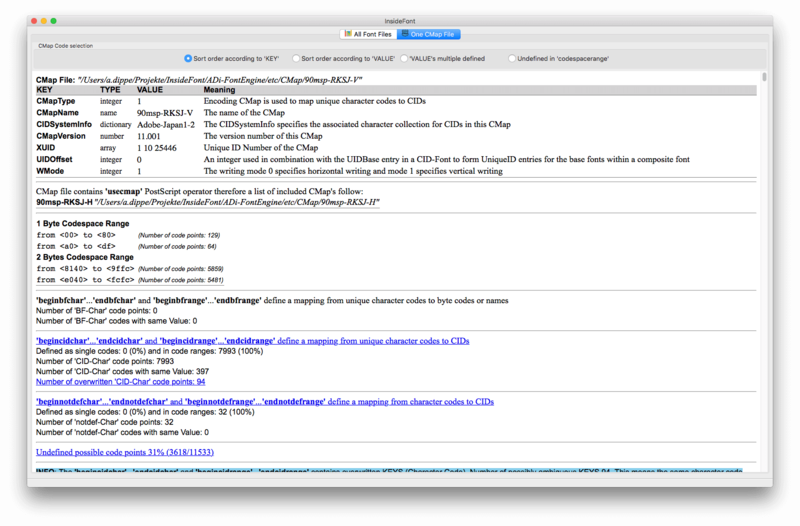 Because CMap files have to be PostScript files first, they are checked by the PostScript interpreter of the ADi-FontEngine. In the information, displayed after the opening, issues are highlighted with colours. One or more Bytes. In PDF encodings up to 6 Bytes occur as a single Byte code depending on the encoding used. Is a number (0 – 65535 ) assigned to a specified character. Those characters are defined in character collections. The value assigned to the byte code. This can be a unicode or a CID for example. A PostScript command which displays another CMap file at this position. Defines the range of allowed byte values in the byte code. Those define a range of values for each byte in a byte code. Byte codes can be defined in a CMap file either as single code points or in a group. (Cirtical) Codespace range error e.g. if a byte code is used which doesn't lay in a defined code space range. Additionally all byte codes which are allowed in the code space ranges but don't have a mapping code are displayed. The ADi-FontEngine is a library developed in C++ (static or dynamic, 32 or 64 bit) for analyzis and manipulation of fonts be it as file or as stream e.g. from a PDF file. It's optimized for PDF programs. Integrated new PostScript engine, no GhostScript or something similar. CMap file support. CMap is an Adobe PostScript format to store encoding information. InsideFont does not require an installer. Just download the zip file, unpack it in any directory (best one you can find again easily) and run InsodeFont.exe. If you don't need InsideFont anymore it's enough to delete the InsideFont.exe. If your using a Windows 64 bit operating system it's recommended to also use the 64 bit version of InsideFont. If you find any bugs or you are missing a function in InsideFont the easiest option is to send me an E-Mail. I will answer everytime and provide a updated version when time allows. The ADi-FontEngine is a platform independent software libraby which can be licensed by everybody. If you’re interested or if you have any questions send an E-Mail to info@insidefont.de or use the contact form below. The data you enter here are raised and processed (possible storing in a local address book) only for communication purposes between you and me. A provition to third parties or storing in an external database takes place at no time. The application InsideFont is freeware and may be used and copied by everybody. It's not allowed to sell or destribute InsideFont with other conditions than those described here. The usage happens at own risk. Here some personal information about me (Andreas Dippe). I am an diploma engineer living and working in Berlin, the German capital. I am married and have a grown son. I have discovered my passion for programming already during my electrical engineering studies and stayed with it. I’m employed at a software company located in Berlin (callas software gmbh) focused on development of PDF evaluation and correction software. I am “Senior Software Engineer” and responsible for the PDF- and Font- Core functions. My work's result can be seen in Adobe Acrobat Professional since several years. I decisivly contributed at the “Preflight” module. In the meanwhile lots of industry leaders licensed this software. In my leisure I developed a fast, compact and portable FontEngine which is also used since 2013 in pdfToolbox and pdfaPilot by callas software gmbh. Special thanks to wxWidgets Community as the GUI of InsideFont has been completely created with this OpenSource library. And to my son for supporting me with this website.